Irmir Mitchell stuffed Bonanza quarterback Kyle Allison’s sneak attempt at the 1-yard line on the final play from scrimmage to clinch Cimarron’s first league win of the season. Cimarron-Memorial football players celebrate a 21-17 victory over Bonanza at Bonanza High School on Thursday, Oct. 11. Sam Gordon/Las Vegas Review-Journal. 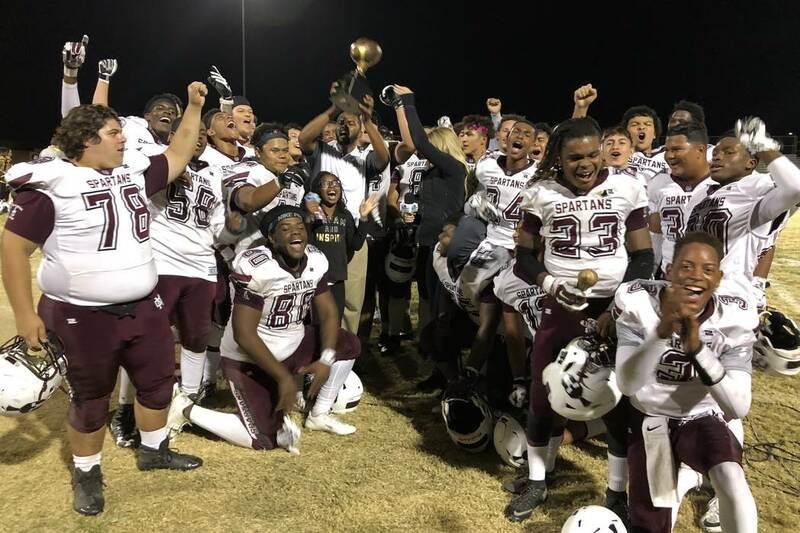 Cimarron-Memorial defensive lineman Irmir Mitchell was fatigued after a 21-17 road victory over Bonanza on Thursday night, partially from the game itself. And then from making the game-saving tackle in the final seconds. And, finally, from being the center of attention in the celebration that followed. Mitchell stuffed Bonanza quarterback Kyle Allison’s sneak attempt at the 1-yard line on the final play from scrimmage to clinch Cimarron’s first league victory this season. The jubilant Spartans (3-6, 1-4 Northwest League) mobbed him, storming the field as time expired. The Bengals (2-6, 0-4) forced four turnovers en route to a 17-14 halftime lead. Bengals linebacker Justin Bacon returned a fumble 99 yards for a touchdown and defensive lineman Leatuvaloalii Tulimasealii rushed for a 34-yard touchdown from the running back position. But the Spartans responded with defense and patience. Star running back Jordan Norwood rattled off several long runs, finally breaking through for a touchdown from 5 yards out three minutes into the fourth quarter. He finished with 206 yards on 31 carries to retake the Southern Nevada lead in rushing from Arbor View’s Kyle Graham. Bonanza relied on its running game on its final drive, and converted a pair of fourth downs in the process. Allison nearly scored on a designed quarterback run, but was tackled just short of the goal line with 10 seconds left. Spartans coach Kory Walker said he expected the Bengals to pass to ensure one more play.